When you don’t know, or don’t really understand why a friendship ended. Most of us can relate to an ended friendship. Many of us can relate to the pain and confusion that this can cause. Sadly, many of us can also relate to the crippling self doubt that occurs in the wake of the heart ache, which seems to be exacerbated if you don’t know the reasons for the fri-ending. Maybe you suddenly noticed you were unfriended and blocked on social media without any explanation. Maybe you had a falling out about something, and parted ways, but you always thought ending it on a petty disagreement didn’t fit and you wondered what the real reason behind the ending was. Maybe your friend did give you a reason, but it wasn’t clear to you exactly what the issue was, either she didn’t say or you didn’t understand. Or maybe she told you clear as day why but you disagreed or couldn’t accept her perception of things? I have experienced all of these, and can definitely relate. I have questioned myself, and sometimes the friend in question about how I could fix the matter. I have apologized for things I didn’t do, or apolgised even though I didn’t really know what I was apologizing for. I have replayed endless conversations in my mind, looking for clues of offensive things I said, or things I failed to say but should have. I have re-read emails, texts and messages long into the wee hours of the mornings looking for answers or signs of when things started going wrong that I missed. I have had endless imaginary conversations with ex-friends in my mind. Some where I am relentlessly sorry and willing to prove my worth and regain trust. Some where I am cool calm and collected, where I state my case confidently and don’t care for the outcome. Some where I underline the triggers I think both of us have encountered along the way and we come to a mutual understanding. And even some where I am witty and funny with just the right come backs and use humour to navigate the stormy seas. All too little too late of course, and all conversations that almost never end up becoming a reality, and if they do, the person never says any of the stuff I planned responses for in my mind. I wish I didn’t do this. And I wish I could tell you to stop doing it too. But we both will. This is the mind’s way of trying to find closure, to understand what happened at least so we can move forward and learn from past mistakes as it were. Let me help you with this one. You mean something. You matter. Regardless of them! 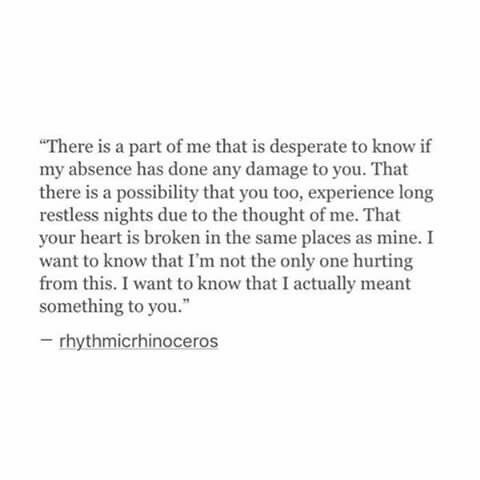 And you know you probably did mean something to them once, even if you no longer do. The problem with that though, is that we assume we have made a mistake. That we must be in some way to blame. This is neither true nor helpful, and blaming yourself will only hurt you further. Of course, then the brain goes on the defensive, listing all the things you did for that friend that she didn’t appreciate or the things she said or did that were hurtful or offensive, and you go on to try and turn it all around and tell yourself you are glad that friend is no longer in your life anymore. At least telling yourself that feels like closure even though it isn’t because you still harbour feelings of anger and resentment. This is natural of course, because as I have mentioned before when someone says I hate you they really mean you hurt me. And that is the crux of the issue. Someone hurt you. The brain gets caught in this holding pattern of needing the same person who hurt you to be the one who heals you. And as it gets stuck there, the wound just keeps bleeding. Just like any other wound to your body, emotional scars can heal themselves, if we stop picking at them. So how do we do that? Apply pressure to the wound! Don’t let any negative germs in – self doubt. Don’t worry about why this friendship has ended. It has. For now anyway. It may help to consider that this may be a temporary separation. Instead of focusing on the past and searching for clues, or focusing on the future and having imaginary conversations, concentrate on right now. What do you need right now? You need sleep. You need self care and love. Instead of confronting your friend, or begging her, think about what you feel and why. Not what she feels. Not what she did or didn’t do or what you did or didn’t do. You feel hurt, you feel abandoned. You feel not good enough. You might even feel a bit like you failed. This can bring on feelings of shame and guilt. None of that feels good. But once you identify it, you can start healing it. You can remind yourself of all the lovely qualities you offer, things you are proud of and remind yourself that nobody else gets to judge if you are good enough or not. Maybe you did make a mistake, or maybe you didn’t. Your friend has chosen to walk away, so remind yourself that was her own choice, not your consequence for poor behaviour. Think of things you can do to move forwards and achieve some of your own goals. If you don’t have any – set some personal goals! Focus on yourself. You deserve it, and you are worth it. When you feel the endless relentless thoughts creeping in, instead of googling it and reading endless articles like this one, focus on something green, for example. How many green things can you see? The lawn is green. Did you water it today? Just redirect your thoughts and a new thought trail will happen. I often start by saying to myself “I don’t want to think about this.” Sometimes it helps to talk to someone about it, even if you don’t change anything, and sometimes it helps to write it down, and then leave it alone. What you are achieving when you get bogged down in the semantics, is reliving the hurt over and over. You need to acknowledge the hurt, allow yourself to feel hurt and validate those painful feelings, then remind yourself that you did not deserve to be hurt and agree to stop hurting yourself more by trying to understand the reasons why. Maybe the other person knows why, or maybe they don’t really know either. At the end of the day understanding it changes nothing anyway. It still happened, as life tends to do. It will pass, if you let it. Stop trying to blame yourself or themselves. Easier said than done, I agree, but possible. Note – If you need to say sorry, then by all means do so. Once. Then leave it alone. Only time will tell what will happen and we cannot control the outcome one way or the other. I don’t know what will happen, but I do know it will be ok. I’m sure of it!